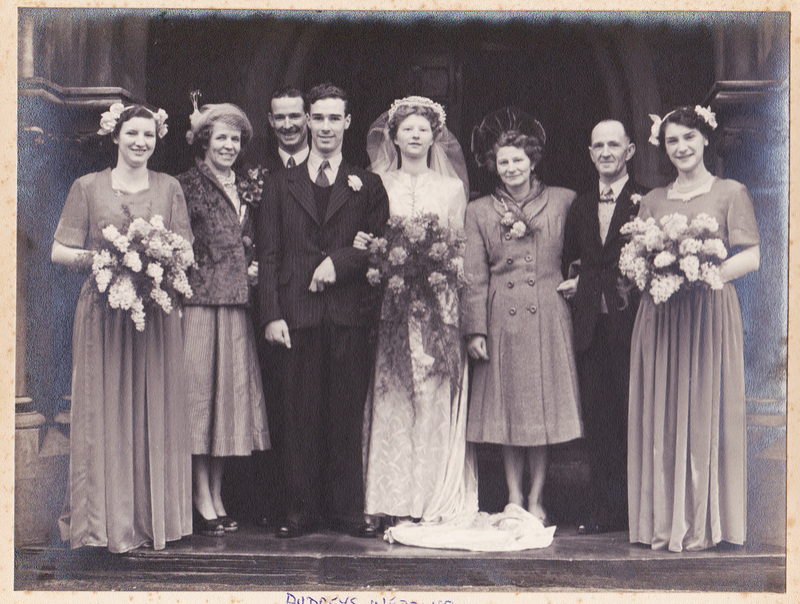 At the wedding, c.1950, St Andrew's, Nottingham, of Audrey daughter of Norman and Doris. Norman Dawson is standing on the right hand side of the image, Doris to his left. By courtesy of Mr Ian McCraight, Norman Dawson's grand-son. In the gardens at South Normanton, early 1970s: from the left - Doris Dawson, Norman Dawson (wearing cap), Audrey McCraight (nee Dawson) and Audrey's three children Hilary, Linda and, standing at the front, Ian. By courtesy of Mr Ian McCraight. Norman Dawson is one of the men on the Bottesford ‘church list’ of WW1 Servicemen. 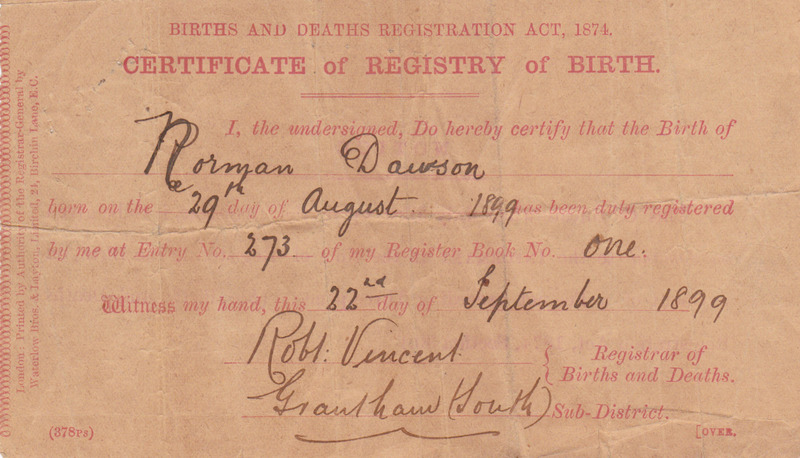 Norman Dawson was born in 1899 in Bottesford, and baptised in the parish church on the 20th September of that year. His parents were James and Florence Mary Dawson. James Dawson, his father, was a blacksmith, born on the 31st January, 1861, in Goulceby, south-east of Louth in Lincolnshire. His first wife was named Laura (neé James, born in Bottesford). They married on the 11th February, 1888, at St Annes, Nottingham, and lived in Spaltons Row, Bottesford (now known as Wyggeston Cottages). By 1891, they had an infant son named James. James senior’s brother Arthur, also a blacksmith, was staying with them on the night of the 1891 census, as were sick nurse, Elizabeth Gibson, and a blacksmith’s apprentice, Joseph Hall. Sadly, Laura Dawson died in the spring of 1894. James Dawson’s second wife, whom he married late in 1894 in Bottesford, was Florence Mary Lamb, who was born in Bottesford in 1873. They left Bottesford and by the 1901 census lived on Derby Road, Risley, near Shardlow, Derbyshire. James senior now described his trade as a “shoeing smith”, and was employing three ‘assistants’. By the time of the 1911 census, James had moved his family back to Bottesford, to live on the High Street at its junction with Belvoir Road. He was now a ‘journeyman blacksmith’, indicating that he did not have work premises of his own. 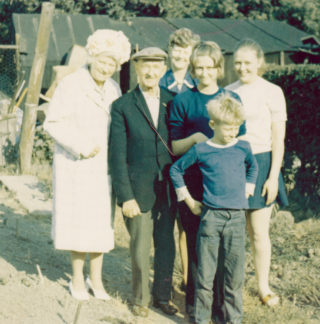 His oldest son, James (aged 19), was working as a porter (probably at Bottesford station), while his half-brothers Norman (aged 11) and Wilfred (6 years old) would have been attending the village school. James Dawson senior died on the 9th July, 1915, aged 54, and was buried at Bottesford. A brief note of his funeral was published by the Grantham Journal on the 17th July of that year. The military service record sheet for Norman Dawson indicates that he joined the RFC on the 3rd October 1917, and went on to be part of the newly formed RAF from the 1st April 1918. He was just 18 years old when he enlisted. 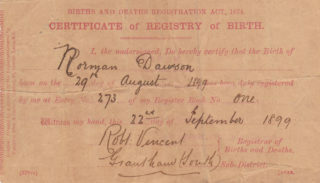 The record states that his Service Number was 98293, that he was a Motor Driver, and that his next of kin was given as his widowed mother, F. Mary Dawson, who had moved to 87 Wollaton Street, Nottingham. He was transferred to the reserves on the 15th December 1919, and presumably discharged soon after. After leaving the air force, Norman Dawson was employed at Belvoir Castle as a gardener and chauffeur, but had to leave in 1920 when the Belvoir Estate was in a financial crisis and men were being laid off to save money. He then worked as a van delivery man for E. Scorer, Knipton. He got married in 1925. The Marriage Certificate tells us that Norman Dawson, a chauffeur mechanic, son of James Dawson, blacksmith, married Doris Ely, daughter of Joseph Henry Ely, a colliery deputy, on the 19th December, 1925, at St. Leodeganus’s Church, Nottingham. Their address was given as 53, Monsall Street, Basford. 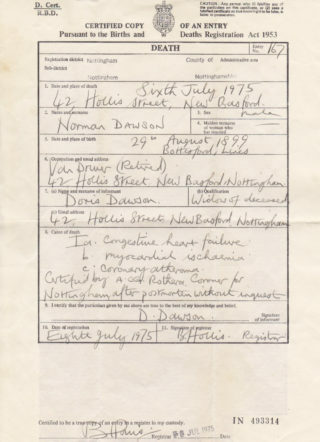 The record in the 1939 Register shows that Norman Dawson (born 29th August 1899) and his wife Doris (born on the 29th December 1901) lived at 54 Hollis St, Nottingham, and that by this date he had become a radio and electrical installation engineer. 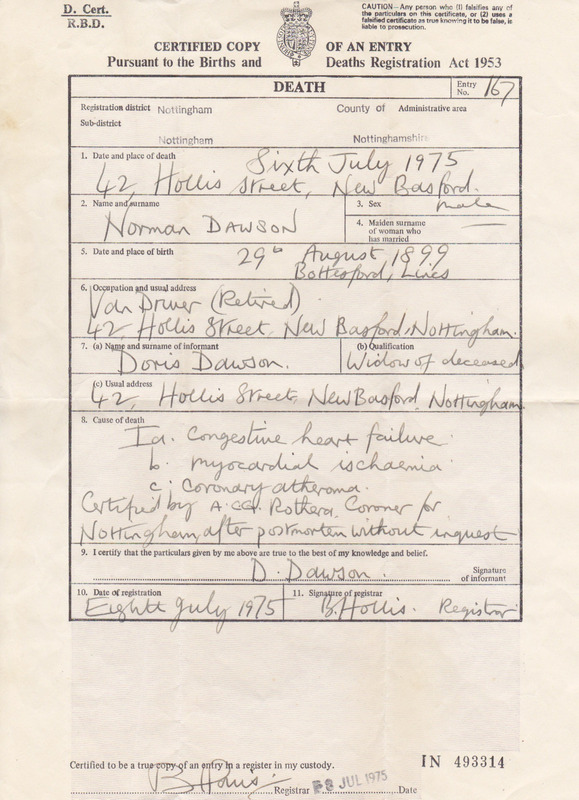 Norman Dawson died on the 6th July, 1975, at his home of 42 Hollis Street, New Basford, Nottingham, leaving his wife Doris. Norman’s half-brother James (born 1891/2) may well also have served, but this has not been confirmed. 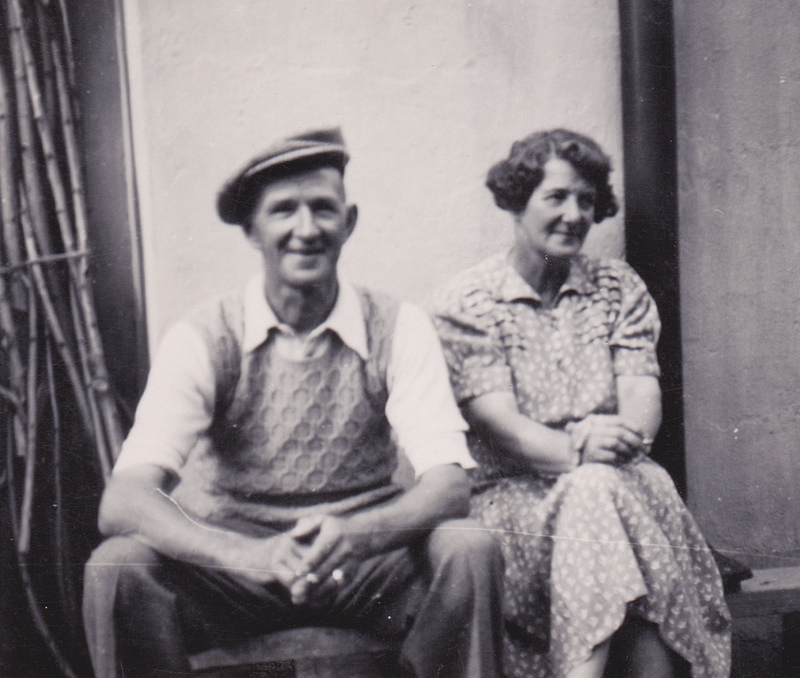 We do know that, aged 21, he married Ada Brewin, aged 18, on the 29th July, 1911, at St Wulfram’s, Grantham. However, neither the date nor the place of his death have been discovered, nor was he located in the 1939 register.